Acorn squash is one of those delicious foods you’ve probably walked past a hundred times in the produce aisle. You know they taste incredible, but knowing how to cook them isn’t quite as intuitive as with some other veggies. Luckily preparing acorn squash is easier than you may think, and with a combination of delectable flavor and a host of nutrients, adding this to your cooking repertoire is well worth the effort. Learn how to cook acorn squash in just three simple steps. Grab a glass pan or baking sheet and preheat the oven to 400°F. Thoroughly wash the exterior of the acorn squash; then use a chef’s knife to slice the squash in half from the base to the stem. While there are a few schools of thought on this, the easiest way to remove the stem is to cut the squash in half and then remove the stem manually (or by using your knife). At the center of the squash, use a large spoon—a serrated edge can make this part easier—to remove the seeds and “guts” of the squash. One of the most popular ways to season acorn squash is with brown sugar and butter. For this warm, sweet flavor profile, melt some butter (one to two tablespoons should do the trick) and pour it evenly over the interior of the squash; then sprinkle with about a tablespoon of brown sugar. 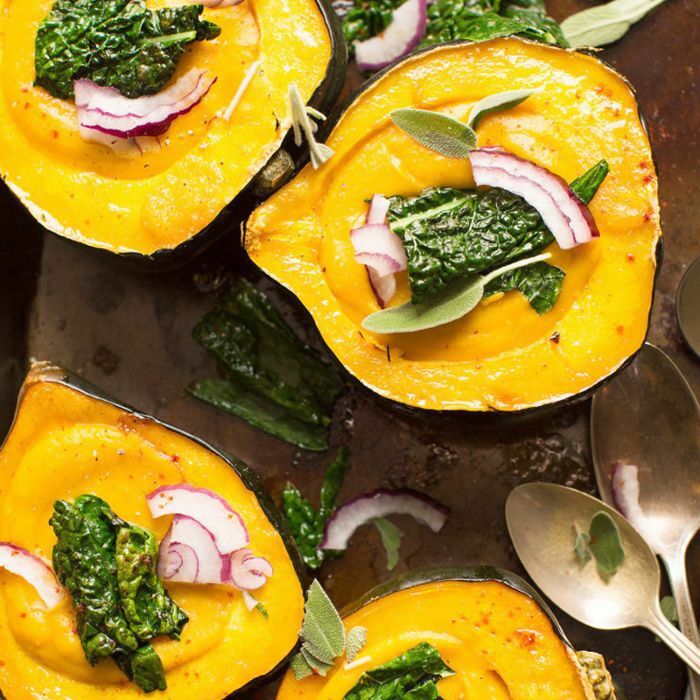 Another option is to use spices that give the acorn squash a savory appeal. For this method, rub the interior of the squash with about a tablespoon of olive oil; then evenly sprinkle with salt and pepper to taste. You can also use a pinch of herbs de provence to impress your dinner party guests with minimal effort. Start by placing your acorn squash halves face-up on the baking sheet. To minimize clean-up time, you can also layer the baking sheet with parchment paper beforehand. Cook for 45–60 minutes, depending on the size of the squash, and be sure to check the oven periodically. Insert the tines of a fork to test whether the squash is ready. Interior should be soft and easy to pierce. Remove squash from oven and allow to cool before serving. Now that you know how to cook acorn squash, it’s time to take your culinary knowledge for a spin. See how to make this winter-friendly kale, tomato, and acorn squash soup.